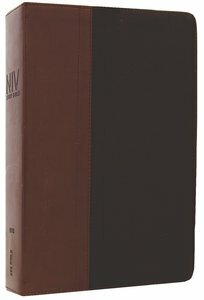 About "NIV Study Bible Chocolate/Black (Red Letter Edition)"
This enormously popular study Bible features over 20,000 textual notes, incorporating icons that make key information easy to spot. Also included: personality profiles; in-text charts, diagrams, and full-colour photos; concordance and subject index; 16 pages of full colour maps; and more! 8.9/9.25-pt type. Customer Reviews For "NIV Study Bible Chocolate/Black (Red Letter Edition)"
I just bought this great Study Bible for my daughter. The Bible is in a beautiful soft imitation leather. It is easily handled in bed or sitting because it lays flat. The colour maps and charts are beautiful. But most of all the font is easily read. although only 8.9, it is dark and crisp and the study notes at the bottom are also able to be read. There is an update of the Study Bible by Carson. However, we found that even the Large Print version is not easy to read. My daughter is thrilled with the purchase. What's missing: We wish it was wider margined for note-taking...though she is loathe to mark such a beautiful Bible. I also like the thumb-indexed version, but it is somewhat more expensive.